Dynamic performance: The liquid-cooled 649 cc engine uses compact internal architecture, a quick six-speed low ratio gearbox and starter/clutch layout with cylinders canted forward 30 degrees for a lower centre of gravity, packing a real pound-for-pound punch. Increased power: The proven DOHC 16-valve cylinder head with direct cam actuation and 11.4:1 compression ratio increases peak power delivery at 11,000 rpm. Excellent torque: Tuned for increased torque and effortless performance in low and mid rpm, the four-cylinder engine can smoothly pull away from idle at 1,500 rpm in sixth gear. Optimal fuel economy: Specific mapping and timing work together to optimize fuel economy and deliver over 350 km in range from the generous 17.3L fuel tank. 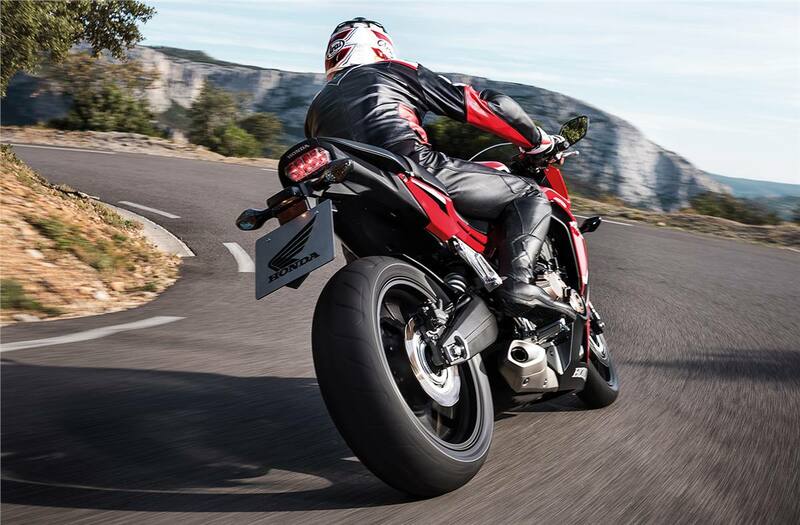 Sporty sound and feel: The attractive right side-swept 4-1 exhaust features a dual-pass internal structure to reduce back pressure and deliver an addictive high-rpm howl, reminding riders of its CBR racing heritage. Quality construction: Asymmetric piston skirts, ferrous spines on the cylinder sleeves and a silent SV cam chain using a Vanadium coating on its pins ensure reduced friction, minimal oil consumption and improved heat transfer. 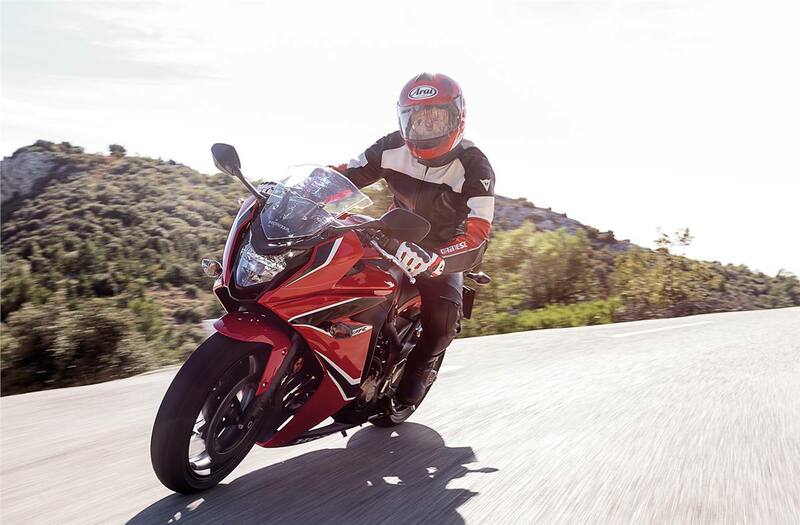 Quick acceleration: Shorter gearing ratios mean the new CBR650F takes off the line faster than its predecessor, with noticeable power from 5,000 rpm due to new intake and exhaust management. The PGM-FI fuel injection system operates with information from four separate throttle body sensors on 32 mm throttle bores for crisp and accurate throttle response. Sharp response: The new intake/exhaust management and short air intake funnels deliver an enticing sound at start-up, with a sharper response under acceleration as the throttle opens up and engine revs to higher rpms. Sporty handling: A rigid steel diamond frame paired with twin 64 mm x 30 mm elliptical spars provides sport-inspired balanced handling, specifically tuned for high levels of rider feedback and sharp performance. Comfort and stability: Brand new 41 mm Showa Dual Bending Valve (SDBV) front fork improves ride comfort and handling stability through proportional rebound damping with firm compression damping. Adjustable suspension: The single-tube monoshock suspension offers 7-stage spring preload adjustment and operates directly on the curved gravity die-cast aluminum swingarm. Attractive design: Blacked-out cast aluminum six-spoke wheels with 120/70-17 front and 180/55-17 rear radial tires also feature L shaped air valves for easy maintenance. Stopping power: Revised two-piston Nissin calipers work the front 320 mm wavy disc brake with a single-piston rear 240 mm disc and two-channel ABS fitted as standard equipment. 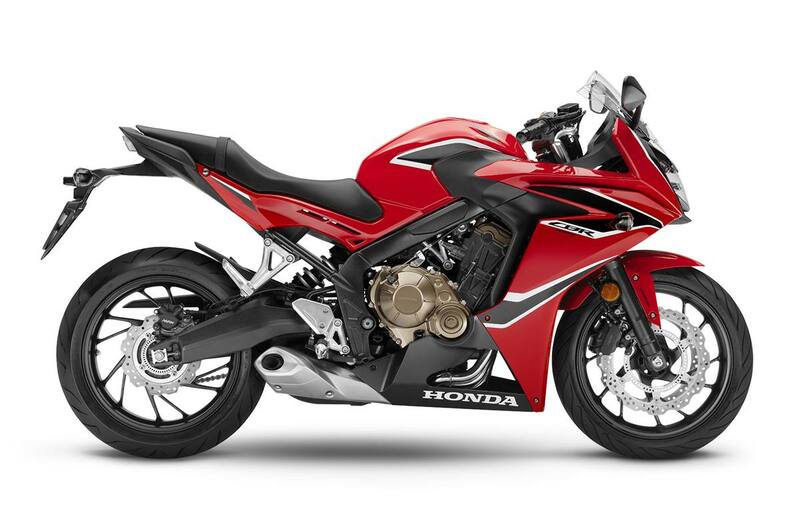 Sleek styling: New super sport CBR-inspired fairings offer sleek design and attractive styling to help channel airflow for great performance and handling. The bronzed engine cover, blacked-out frame and chiseled sport bike appearance come together to deliver an aggressive speed shape, further accented by the crisp LED headlight and clear-lensed LED taillight. Comfortable seating: The sporty yet relaxed riding position with 810 mm seat height offers a carefully shaped comfortable seat that also helps minimize vibration. The firm and narrow middle profile allows riders to easily reach the ground with ample seating for a passenger. Digital display: The digital dash includes twin large screens that display speed and rpm on the left with the fuel gauge, clock, odomotre and warning lights on the right. Both screens feature bright white back lighting. Safe and sound: A compact ‘wave’ design ignition key offers increased security and reduced chance of breakage.